Old Drift Lodge, located in the Zambezi National Park in Victoria Falls, was opened in May 2018. 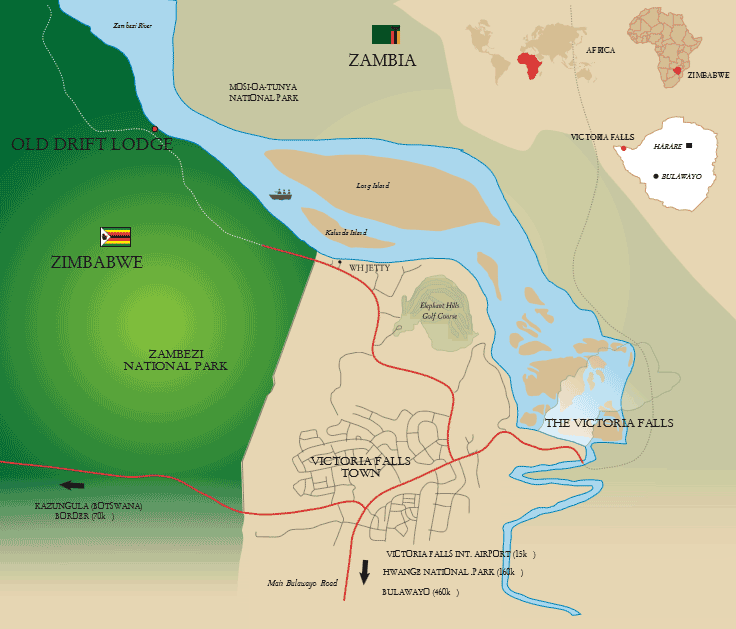 It is set on the banks of the Zambezi River, a 10 minutes boat ride from the Wild Horizons jetty in Victoria Falls. The location is where trade between tribes used to happen in the bygone era, which gives a historic feel to the lodge. Old Drift boasts of a fresh look and has a combination of colour and soft furnishings, which give it a lodge and safari atmosphere. It is run by four managers and has four in house guides to ensure smooth running of the lodge and that guests’ all needs are catered for. On arrival at the Old Drift jetty by boat from Victoria Falls, guests will immediately get to a clock in lounge for orientation before they are shown to their rooms. Rooms have plunge pools for cooling down which is a loved add on, especially in the hot summer months. There is also a lot of space in the rooms with cupboards to allow for unpacking instead of ‘living out of a bag’ during your stay. Complimentary mini bars and tea/coffee stations are in the room for easy access to drinks/hot beverages. A private dinner can be arranged and it will be set up by the Old Drift jetty. For guests that prefer to be alone during meals, tables can be arranged to seat whether 2, 4 or a family that enjoy their privacy. Guests can also choose whether they prefer their guide to be with them during meals or not. All dietary requirements that guests may have can be communicated in advance, and all meals are then prepared with these requests in mind. The main area has a fireplace for a sit around after dinner whilst enjoying the sound of the river and the different animal calls before bedtime. A true authentic safari experience! As the lodge is located in the national park, for safety all guests are accompanied by a guide to get back to their rooms at night-time. In the event of an emergency, guests have a telephone in the room to make contact and they will be attended to. A gym and spa is to be built in the near future for guests that prefer to train in the mornings or for a massage during the afternoon at leisure time. A typical day looks like this: mornings start with an early breakfast before heading out in the bush for either a walk, boat ride or drive – depending on preferences. Guides make sure guests are back at the lodge in time for brunch/lunch served at the main area. After lunch it is time for a siesta or relaxation in the pool before meeting again in the afternoon for high tea and heading out for an activity again! Guests will return to the lodge before sunset for a quick freshening up/shower before dinnertime.